For bargain-conscious parents, buying cheap kids tennis shoes is practical. 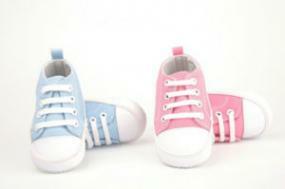 After all, the kids probably won't be able to wear the shoes in a year's time, due to growth and other factors. Spending a lot of money on children's shoes just isn't part of the frugal parent's plan. Growth: You can't see it happening, but you can see the effects. Children are growing all the time. Slow growth spurts will be mixed with fast ones; sometimes, kids grow several inches in one season. 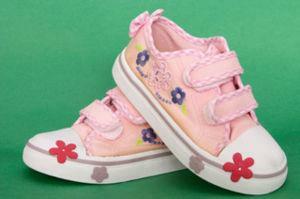 Spending $100 on one pair of shoes can get pricey when those shoes are outgrown in a couple of months. This is especially true when dealing with very young kids, who probably won't care what kinds of shoes are on their feet. Wear-and-Tear: Kids can be hard on shoes, even the best made pair. They run, jump, skip, slide, and drag their feet. They're not as concerned with keeping their clothes and shoes in good condition as they are in having fun. Parents can save themselves unnecessary headaches by outfitting their children in inexpensive tennis shoes instead of constantly worrying if the shoes are getting torn up. Fickleness: Many parents can testify to the fickleness of their kids. What was so precious yesterday is now old news and abandoned. Imagine how irritated you would be if your kid begged for an expensive pair of shoes, only to decide after a month that they're no longer "in." No matter how much a child thinks they're just going to love something, all it takes is a negative comment from a friend or influential person to turn that love into hate. There are many places to find cheap shoes. You are no longer limited to department stores and department store prices. There are shoe outlets and specialty shops that routinely sell shoes for less expensive prices than high-end stores. Many times, these cheaper alternatives will list the manufacturer's suggested retail price (more than likely the full price listed in a department store) along with their price so you can see how much you're saving. Rack Room Shoes and Shoe Carnival also stock popular brands like Nike, Reebok, and Adidas. Don't forget to check your mail or newspaper for flyers and coupons, especially when it's close to the back-to-school season. That's one time of year when stores want to move merchandise, so they offer discounts to get you in the door. Take advantage of sales, but don't fall for 2-for-1 specials if you really only need one. A good tactic is to gather all flyers together and go through them to see what's available and what your child likes. If you want to comparison shop without leaving the house, a site like NexTag lists available brands and the prices offered by each seller. A lot of children today are heavily influenced by the media and their peers. If a certain celebrity endorses a $150 sneaker, kids are going to want it. Not everyone can afford or is willing to shell out that kind of money on kids' shoes. Some parents don't want their children to absorb the message that only the external matters and the more expensive it is, the better. After years of news stories about kids being hurt or even killed over sneakers, NBA player Stephon Marbury joined forces with Steve & Barry's University Sportswear to promote sneakers that cost less than $15. Steve & Barry's hopes that with the publicity and support of Marbury for the "Starbury One," parents and kids will see that there are alternatives to the high-priced Air Jordans of yesterday.There's no need to break the bank when buying shoes for your kids. The less expensive brands don't have to look like cheap kids tennis shoes, with the technology going into footwear today. You might also reason with your children that they can buy two pairs of shoes instead of just one if they go with cheaper options. The older kids become, the more input they'll want to have, but if you teach them about the value of money and that brand names aren't synonymous with cool, they'll be more willing to bargain, and bargain shop, with you.